Jerusalem - Marking International Human Rights Day (December 10), NGO Monitor is publishingSecond Class Rights: How Amnesty International and Human Rights Watch Fail Women in the Middle East. This four-part report evaluates Amnesty International's and Human Rights Watch's coverage of women's rights in the Middle East and North Africa (MENA) region from 1995-2012. The absence of freedom for women in the Middle East is one of the most acute human rights problems in the world today and one of the most significant challenges for the region. NGO Monitor's qualitative and quantitative study shows that while Amnesty International and Human Rights Watch (HRW) project a strong image of prioritizing women's freedom, in reality their advocacy on behalf of women's rights in the MENA region is weak. Anne Herzberg, NGO Monitor's Legal Advisor and author of the report, stated, "as NGOs with huge budgets, rivaling those of multinational corporations, and with tremendous influence among policy makers and in UN frameworks, Amnesty and HRW have a distinct advantage in championing women's rights in the MENA region, having the power to give women's rights issues international prominence." However, as demonstrated in the report, the agendas of Amnesty and HRW appear to have been driven by media interest, US foreign policy, and prominent world events, allowing ideology and politics to prevail at the expense of true freedom for women. This skewed prioritization has had several negative consequences, including allowing MENA regimes to escape scrutiny and maintain the abusive status quo. For example, although HRW acknowledges that the situation for women in Saudi Arabia is untenable, its only major campaign in the country was aimed at participation of Saudi women in the 2012 London Olympics. While this strategy garnered HRW publicity, there is little evidence that the media campaign made any substantive impact on women's freedom in the Kingdom. HRW's reporting is coupled with increased fundraising efforts in Gulf States, raising concerns that abusive regimes are seeking to co-opt the NGO in order to gain much desired credibility, while maintaining power and influence. Similarly, Amnesty neglected to allocate the necessary funds and resources to adequately address women's rights in the MENA region. The organization claims that "[a]dvocates for women's human rights are essential to make rights a reality." Yet, external auditors hired by Amnesty found that the NGO's work on women's issues "had been small-scale and not central to the organization's approach." During their Stop Violence Against Women Campaign that took place between 2004 and 2010, only six reports were published about the MENA region, while a total of fifty-eight reports were produced about women in Africa, the Americas, Europe, and Central Asia, Asia. In 2010, the head of Amnesty's Gender Unit was suspended by the organization after speaking out against the NGO's collaboration with an alleged supporter of the Taliban, the most vicious regime towards women in recent history. 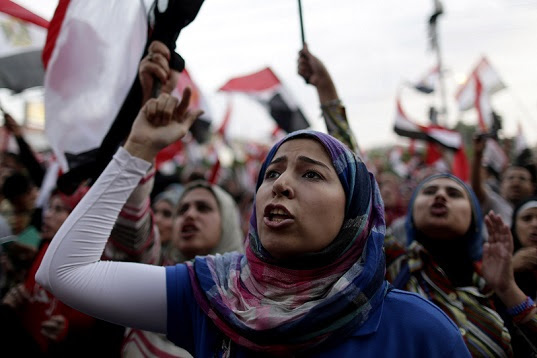 Herzberg concludes, "It was hoped that the ousting of dictators in Tunisia, Egypt, and Libya in 2011 and the mass demonstrations elsewhere, would bring about fundamental reforms, particularly, for women. Unfortunately, these changes did not materialize, and the NGO network shares responsibility." Technorati Tag: Women's Rights and Human Rights Watch and Amnesty International and HRW.